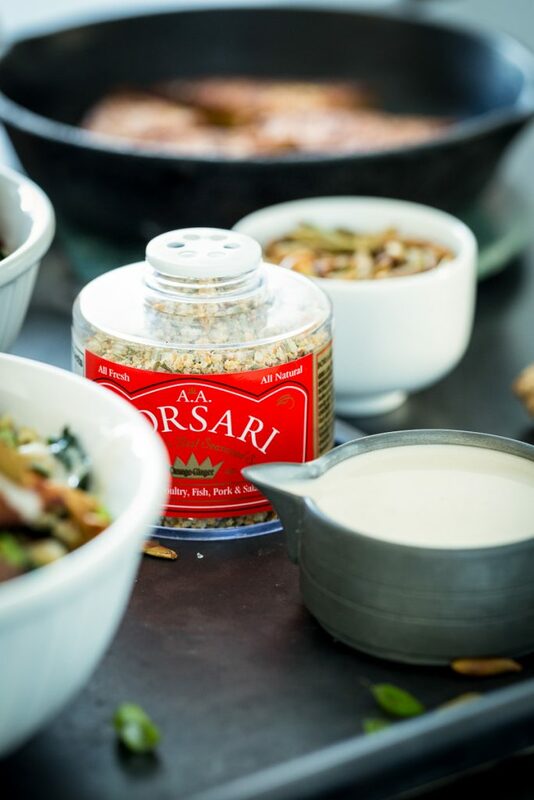 Ever since I did my last Borsari Foods recipe and review, I’ve been falling more in love with the simplicity and ease their seasoning salts bring to my kitchen. When I’m in the mood for something quick and tasty (which is, basically, all the time), I can just sprinkle one of their seasoned salts on whatever it is I’m cooking, without spending time searching for various herbs or spices (though, don’t get me wrong- I still give them plenty of love), and I’m done. My most recent favorite thing to do is to sprinkle it on pan-fried tofu. Pan-fried tofu is probably at the top of the list for ways I love to eat tofu. The tofu must always be well-pressed, and if I have time, I’ll do a quick 15-minute marinade. If I’m in a big hurry, though, I just slice up the pressed tofu and fry it in coconut oil with a little salt and pepper. 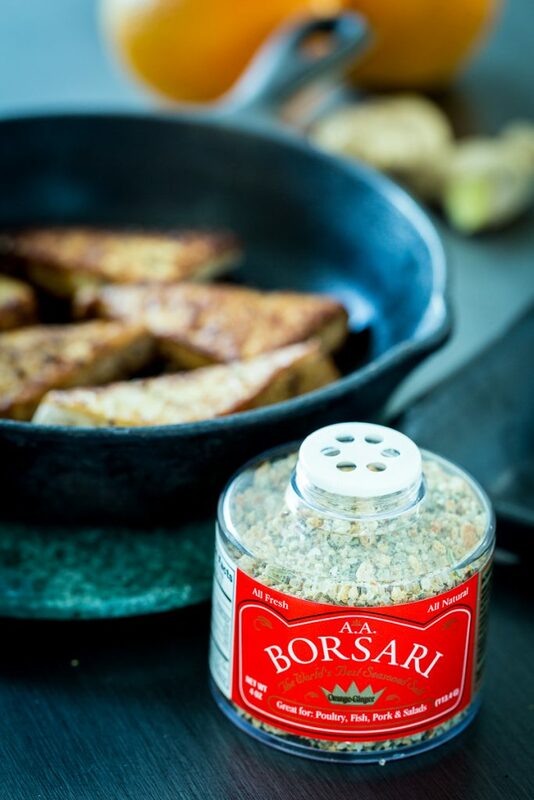 Using a Borsari Foods seasoning salt blend helps to add a little bit more flavor because they’re blended with not only salt and pepper, but a variety of herbs and spices, depending on which flavor you choose. Lately, my favorite has been the Orange Ginger, which is made with dried orange peel, ginger, rosemary, basil, and garlic. For this bowl, I took the flavor quotient up a notch by doing a quick marinade of liquid aminos (though you could also use tamari or soy sauce), orange juice, and fresh ginger. These little pan-fried tofu cutlets are just dreamy with their crispy, golden exterior and their tender, ultra-flavorful inner flesh. They’re perfect by themselves or would be lovely stuffed inside of a sandwich with some creamy avocado, but I love them best as part of these gorgeous bowls. Every bowl needs some sort of grain or starch (like potatoes), in my opinion, but I made the grain for this bowl extra fancy. By sautéing some red onion in sesame oil and then adding kale, carrots, and currants to mix in with the rice, you get a more nutritionally-dense, texturally interesting, and more flavorful base for your bowl. 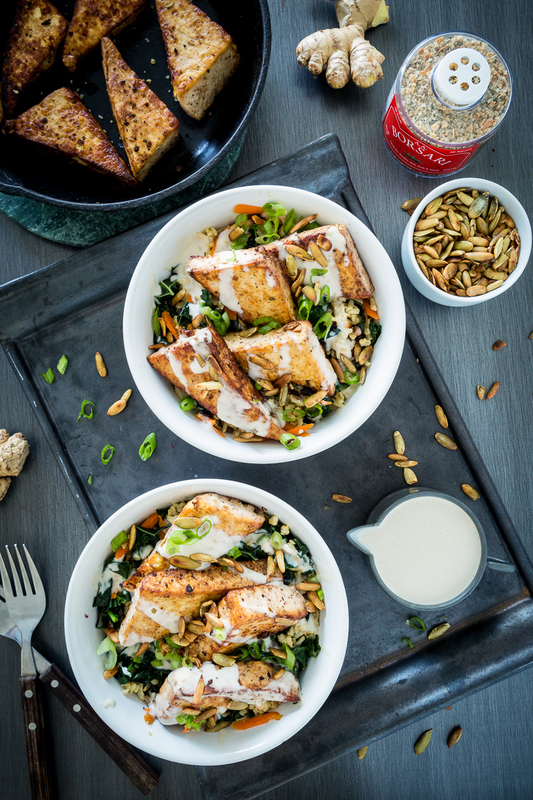 The sweet and savory balance pairs nicely with the flavorful tofu. The kicker for this bowl is the luscious yogurt tahini sauce. 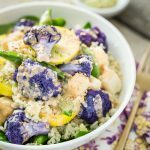 It’s so silky and creamy, lemony and subtly sweet, with a touch of garlic and it really ties the bowl together and helps to marry all of the flavors. 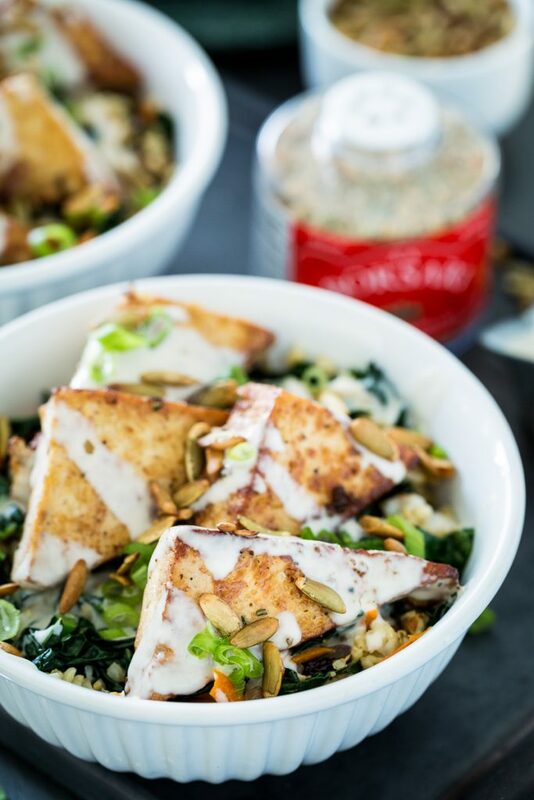 You can’t skimp on the toasted pumpkin seeds on top, either- the crunch they add is wonderful. If you do some planning ahead- pressing your tofu and pre-cooking the rice (which you could also do while the tofu is pressing), this dish comes together really quickly. 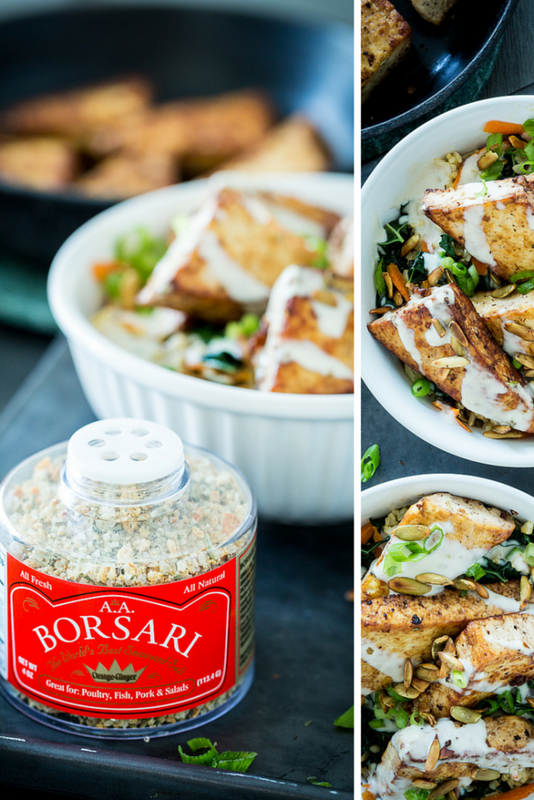 If you can get your hands on some Borsari Foods Orange Ginger Seasoning Salt (if you don’t have some already, definitely enter the giveaway below! ), it definitely adds a lot of flavor without needing to spend the extra time rounding up various ingredients. Plus, being that it’s vegan, gluten-free, MSG-free, preservative-free, and pretty much all bad-stuff-free, it’s a great thing to have in your arsenal. So go get your frying pan out- you’re about to meet my new favorite bowl! In a cup or small bowl, stir together the sauce ingredients until combined. Add water by the tablespoon until you have a consistency you like (I add about 4 to 5 tablespoons). Set aside. Slice the blocks of tofu in half and then slice each of those halves in half lengthwise so that you 8 rectangles. Slice those rectangles diagonally so that you have 16 triangles. Combine the liquid aminos, orange juice, and ginger in a shallow baking dish or bowl. Add the tofu triangles and let marinate for about 15 minutes, tossing every 5 minutes to evenly distribute the marinade. Heat 1 tablespoon of coconut oil in a large frying pan, preferably cast-iron, over medium heat. Add half of the tofu triangles, sprinkle 1/2 tablespoon of the seasoning salt on the triangles, and cook for about 3 to 4 minutes, until crisp and golden. Flip the triangles, add another 1/2 tablespoon of the seasoning salt, and cook for anotehr 3 to 4 minutes, or until crips and golden. Transfer the tofu to a plate lined with paper towels and cover to keep warm. Add the remaining tablespoon coconut oil to the pan and repeat the process with the remaining tofu and salt. Clean out the pan and heat the sesame oil in the pan. Add the onion and cook until translucent. Add the kale and carrots and cook for 1 minute before removing from the heat. Add the rice and currants and stir until combined. Add salt to taste. 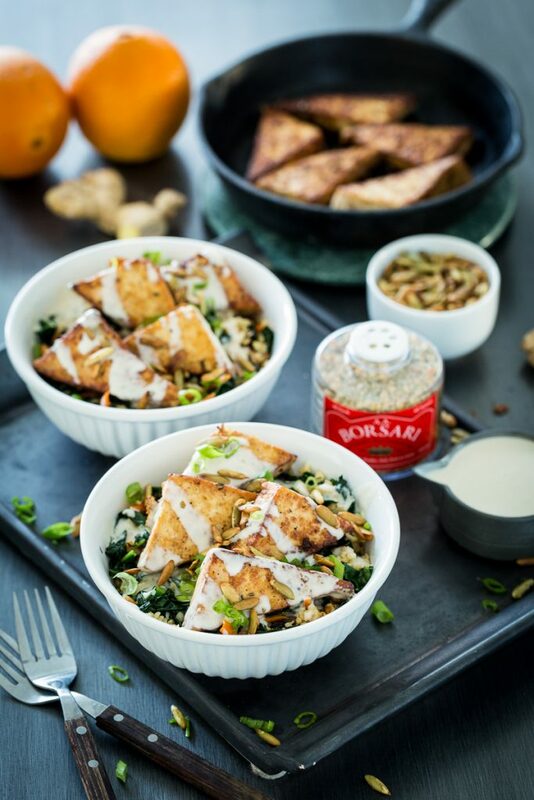 Serve the tofu atop a bowl of the rice/kale combo with yogurt tahini sauce drizzled over the top. Sprinkle sliced green onions and pumpkins seeds over the top. Enjoy! If you don't have the seasoning blend but really want to make this dish, season the tofu with a little dried rosemary, basil, dried ginger, garlic powder, a little orange zest, salt, and pepper. Borsari Foods, being the wonderful, generous folks that they are, are letting me give away another sampler pack of of their seasoning salts! The giveaway is open to US residents only and will run until 11:59pm on July 20th, 2015. Just use the box below to enter. Good luck! You can also follow Borsari Foods on social media! Thank you so much to Borsari Foods for letting me do this giveaway and thank you to all of you wonderful readers for stopping by! Have a great day! Disclaimer: I was compensated for this post by Borsari Foods, but the thoughts and opinions expressed here are my own. 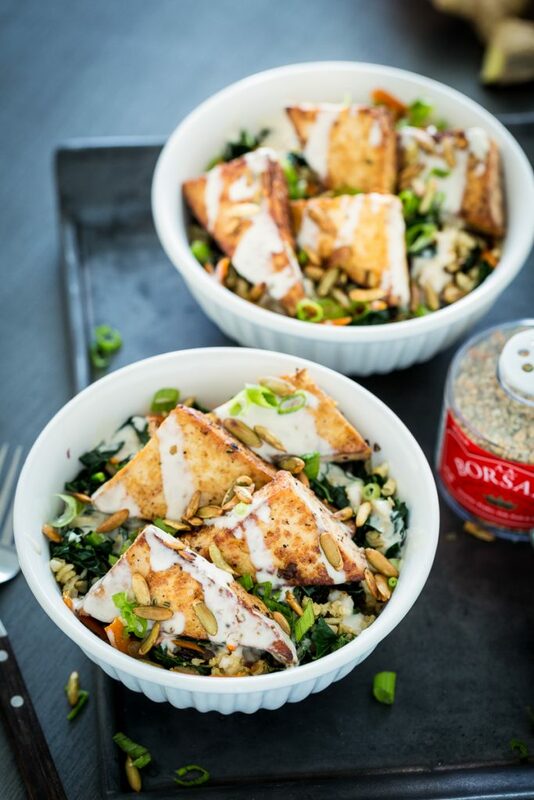 56 Responses to "Orange Ginger Pan-Fried Tofu Bowl with Yogurt Tahini Sauce + A GIVEAWAY!" I love baking tofu that has been marinated in a simple combination of liquid aminos and rice wine vinegar. I love using tofu in pie recipes. My favorite is chocolate French silk pie, yum! I like tofu crumbled with taco seasoning! with soy sauce and scallions! My favorite way to prepare tofu is by baking it. I didn’t learn how to make good tofu until I read the tips in Thug Kitchen. Baking it makes it crispy on the outside, but still soft and juicy on the inside. Delicious. I like to brush it with a little oil , sprinkle with salt and bake it. It’s just really easy. I love my tofu pressed and drained, then cubed. Then pan fried in a tablespoon of toasted sesame oil, until golden. Then add a mixture of 2 T rice vinegar, 2 T tamari, and 2 T nutritional yeast. Allow that liquid to become almost all absorbed, then shake in some more nutritional yeast until the tofu is coated and dry on the outside, then serve! I love making a scramble then making a burrito with it or putting them in my noodle soups! i don’t use tofu due to it’s estrogenic properties. I like tofu pan fried. This looks sooo delicious! Definitely my kind of meal. The vegan zombies “how to make tofu taste good” changed my life lol! No prep work and awesome texture and flavor! We love it “blackened”, pan fried. 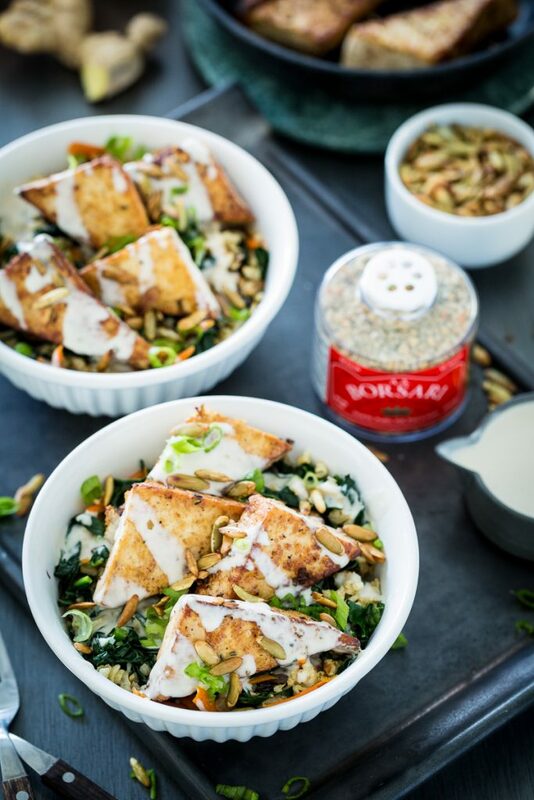 With tofu it is all about the seasonings, but also the creamy texture inside. I always love new seasoning combinations! I love a simple baked tofu where I cube the tofu and marinate it in half tamari and half water. Delicious! I try to eat tofu maybe once a week, because there are so many other things to eat (had this last night: http://www.feastingathome.com/wok-seared-asparagus-mushrooms/ (I used Bok Choy), so I’ll have to make this next week. Thanks. Not to double entry, but I forgot to answer the question: I think a long marination is key most of the time and then pan-fried. I love making tofu scramble! I like to marinate and bake tofu. My favorite way to prepare tofu is using the Lemon Rosemary tofu marinade recipe from Cadry’s Kitchen, yum! But I also love a good tofu scramble! We have a Tofu FRY Fridays! I love tofu that has been pressed, seasoned with liquid aminos, granulated garlic and onion, sprinkled with poultry seasoning and baked. I baste it with a wee bit of oil (just enough so the seasoning sticks), sprinkle with salt and herbs and bake in the oven at 350 degrees for 15-20 minutes until pale golden. Super simple. I like crisping each side of tofu slices for a little crunch on the outside! Stir fried with sesame oil, ginger, garlic, soy sauce and a little maple syrup. I love to either bake tofu after a good marinade or dry-sear it to a nicely browned crispness. I find both methods yield the best texture and flavor! I love tofu baked or pan fried. I have no idea what my favorite way to prepare tofu is. I’ve only ever had it twice, and I don’t even remember what they were! lol I’m looking for a way, though. Definitely a tofu scramble; after that some kind of baked tofu that’s been marinated awhile. That looks good! I love to pan fry tofu, especially for Chinese-style stir fries. 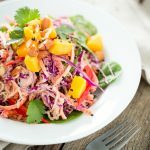 I love tofu in Pad Thai but I haven’t made it myself yet. Slices of smoked tofu on round of jicama with avocado slices. 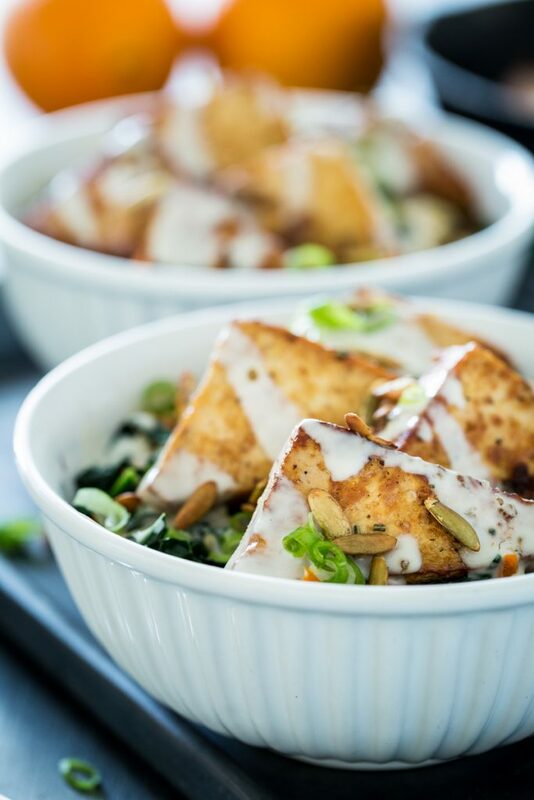 I like to bake tofu with a maple marinade and cover it with pistachios! My favorite way to prepare tofu is to cut it into cubes and stir fry it so that all sides are crispy. I love my tofu stir-fried with lots of veggies. I like to either marinate my tofu and pan fry it or make a yummy tofu scramble! I cube tofu, then freeze/thaw it – it gives it a super spongey, firmer texture. A quick thaw and it’s ready to saute in a cast iron pan and go in a stir-fry! I like to cut it into 1/2 slabs and marinate it overnight and and then grill it up. 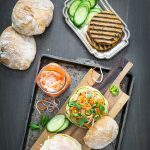 Gives it a thicker, chewier feel which is great in sandwiches or as burgers. I also got denied by Pinterest with the message that the pin might lead to spam. grilled tofu is my faaav!!! I’ve tried the recipe and the whole family loved it. I’ll make it again for our guests tomorrow! This looks delicious! Plus I haven’t been cooking with Tofu much lately and this reminds me how simple yet delicious it is. I may add in some seared radicchio for the superfood benefits, but otherwise would leave it exactly as it is. Thank you for the recipe!